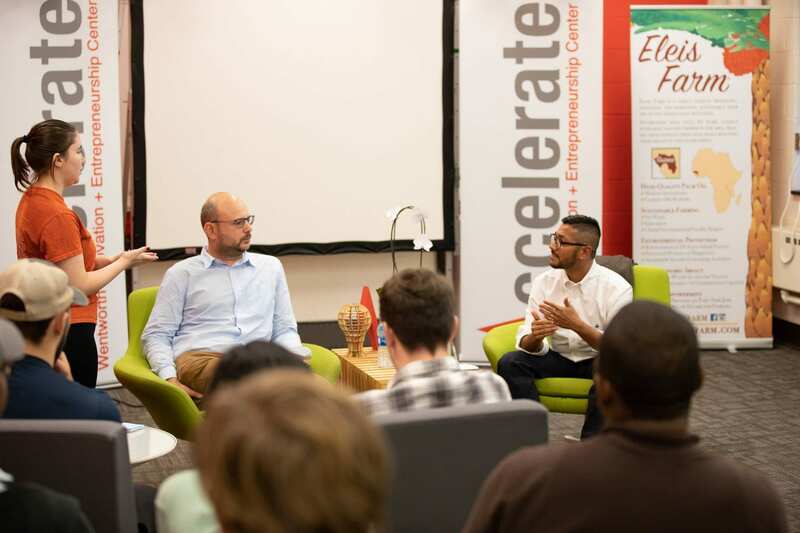 On Thursday Sept. 27, Accelerate welcomed Anil Achyuta into our space for our fall DeepDive! 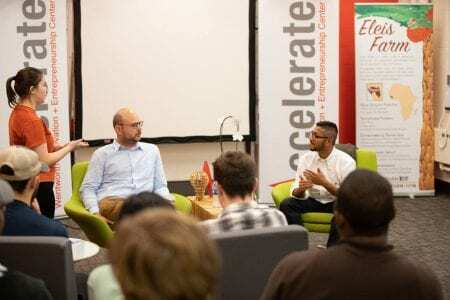 Anil was spearheading a conversation titled Innovation in Companies. We set up our classroom area in a campfire format, and students gathered round to hear Anil answer questions about innovation from our Director of Programming Max Rollinger and the assembled students. 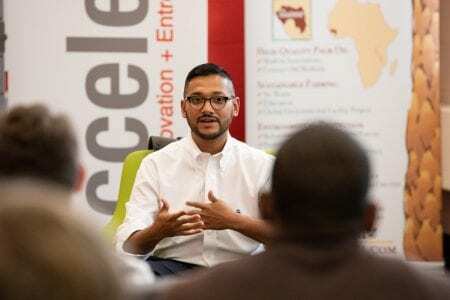 The conversation began with a question about Anil working at a startup, one of the first positions he held in his career. He began on a humorous note, saying that the work environment was not all that dissimilar from the HBO show “Silicon Valley,” because of the often breakneck pace! That anecdote segued into his arrival in the United States, for which he recalled bringing just $135 and having to rack up thousands of dollars in debt in order to supply himself with clothes, food and housing. 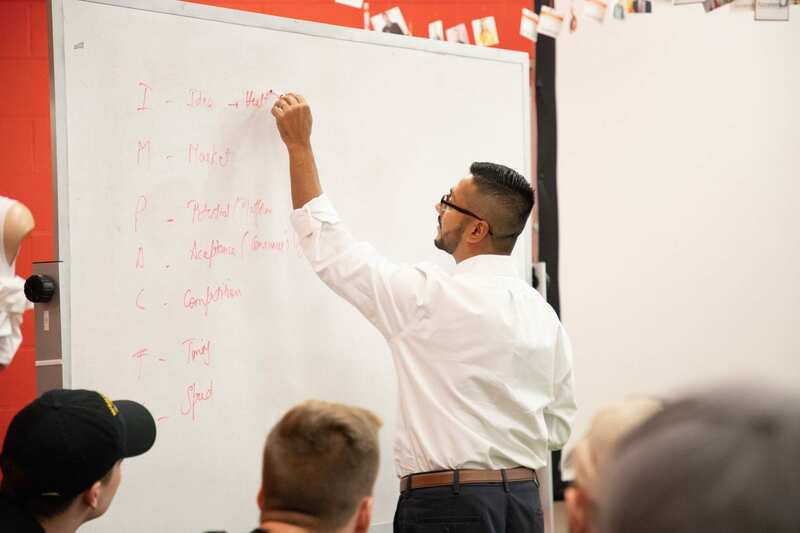 He used that story to convey the importance of needing to do something you enjoy, because working at or trying to launch startups – particularly while in school – can be both a physically demanding and emotionally exhausting experience. Anil said that the best core competency a person could have is a strong work ethic. That message certainly resonated with those of us at Accelerate, where we preach the value of core competencies for their transferability between any career field. The ability to persevere in the face of adversity is often bolstered by passion – having a reason to persevere. He also said that students today have significant advantages in trying to launch a venture, namely the availability of more venture funding and data, as well as the ability to work remotely and collaborate with people on an international scale. “Innovation has changed dramatically since I started,” he said. On the topic of pitching, he relayed a proverb that frequently gets passed around in business circles: “When you need money, ask for advice, and when you need advice, ask for money.” He also spoke about the importance of teamwork, and admitted that tensions frequently arise when people of different backgrounds must align their perspectives for the betterment of the company. He also said that learning to work through those tensions is vital to achieving success. At the end of the night, one of our own startup teams pitched to Anil for feedback. Anil’s work at L’Oreal involves identifying promising startups and partners for the purpose of mergers and acquisitions, so to receive his advice was a unique opportunity for Cathleen Hallinan of Cranial Care to improve upon her idea. He had tons of valuable input for Hallinan. We are extremely grateful to Anil for granting us his valuable time, and we hope that all the students in attendance learned as much as we did!